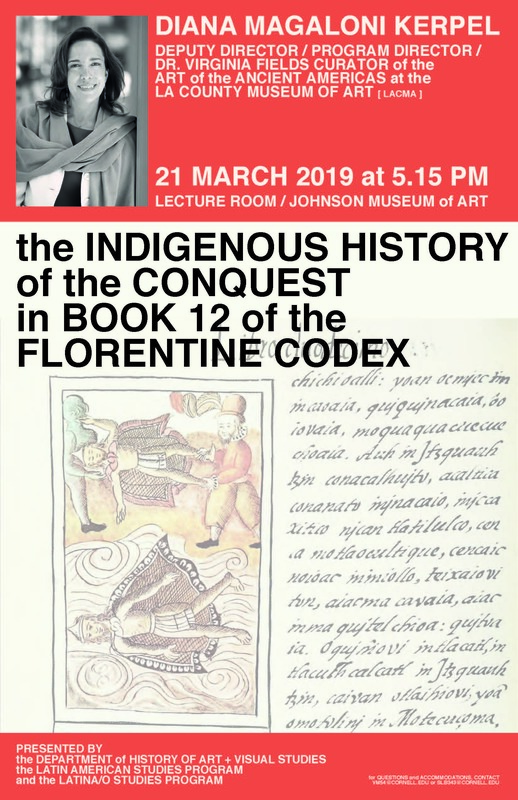 "The Indigenous History of the Conquest in Book 12 of the Florentine Codex"
Dr. Diana Magaloni Kerpel currently serves as Deputy Director, Program Director, and Dr. Virginia Fields Curator of the Art of the Ancient Americas at the LA County Museum of Art (LACMA). She was formerly Director of the Museo Nacional de Antropología in Mexico City from 2009 to 2013. She has also served as researcher and professor at the Instituto de Investigaciones Estéticas in the Universidad Nacional Autónoma de México (UNAM), where she has specialized in indigenous modes of representation and the nature and meaning of the materials used to create ancient mural paintings and painted books. Dr. Magaloni Kerpel has published numerous essays, articles, and book chapters on the arts of ancient Mesoamerica. Her widely acclaimed book, Colors of the New World: Materials, Artists, and the Creation of the Florentine Codex opens new ways of understanding art through the lens of materiality and cross-cultural exchange. She holds a Ph.D. in Art History from Yale University and a B.A. in Conservation from the Instituto Nacional de Antropología e Historia (INAH).